Today, the Early Middle Ages is considered to be from 500 and 1050, although there were still overlaps with Late Antiquity until the 6th century. British, Italian and French historians each choose different dates for the Early Middle Ages based on events from their national history as caesuras. For example, British historians choose the Norman invasion of 1066 as a turning point. New Germanic-Roman empires emerged during this period and had a profound impact on European history. The Byzantine Empire arose in Eastern Rome, and the Merovingians established the Franconian Empire, which became the largest power in Western Europe at the time. Society, politics and culture changed, and Christianity prevailed in Western and Central Europe. Islam spread to Spain, and religious conflicts gradually began. In the 9th century, the Holy Roman Empire of the German Nation and France emerged from the disintegrating Carolingian Empire. In England, the Anglo-Saxon Empire established itself, and Slav empires established themselves in Eastern Europe. Between the 8th and 11th centuries, Viking raids terrorized Northern Europe. A formal-typological distinction between the arrowheads of the Early and High Middle Ages, the latter taking place between 1050 and 1250, is virtually excluded, — even if there were new production methods, social changes, chivalry and the Crusades — except for special regional forms. Therefore, there is no distinction between these two epochs in this book. 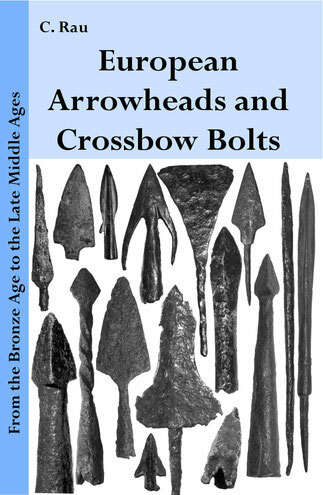 The Late Middle Ages, which dates from the 13th century to the beginning of the 16th century, brought only a few changes to the form-family of arrowheads, because either the crossbow competed with the bow as a weapon and firearms finally displaced archers in the Late Middle Ages. Medieval bow arrows had average lengths between 70 cm and 85 cm. They are fairly well documented with some 5,000 exemplars. In the Early and High Middle Ages arrow feathers were attached to the wooden shaft with pitch. It was only in the Late Middle Ages that animal glues boiled out of bone material were used. Three leafblade arrowheads with two barbed hooks and socket shafts. Their common feature is the longer socket in relation to the blade tip. 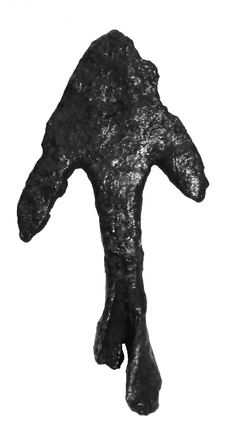 Arrowheads with barbed hooks have six formal-typologically distinguishable features. These three arrowheads belong to the most common Category 1 with single forged sockets and shorter barbed hooks. Different socket lengths can appear that have no special purpose except to increase the weight (with the exception of fire arrowheads, see p. 256). Arrowheads with barbed hooks are difficult to classify chronologically if the find spot or associated finds are missing. They were forged all throughout the Middle Ages and occur throughout Europe, especially in Central and Western Europe. They were used for warfare and hunting. Barbed hooks had the decisive advantage of sticking in the body when the arrow was pulled out of the wound; only the wooden shaft could be removed. The wound would not close, and the arrow would be made useless and could no longer be fired at the enemy. For hunting, arrowheads with barbed hooks were rarely used, because hunting arrows should fall out of the wild game in order to produce heavy bleeding, which weakened the animal. If a hunting arrow remained in the animal, the bleeding could be reduced or stopped altogether. Therefore, elongated leafblade and Rope Cutter arrowheads were much more suited for hunting, because these usually produced large, deep cuts and mostly did stick in the body. Arrowheads with barbed hooks can be divided into five categories and two subcategories. Overlapping characteristics may occur, but a categorization of the predominant finds is still possible. 6. Arrowheads with barbed hooks and simple socket shafts. A large arrowhead with rounded blade tip, a curved wing pair and a twisted socket shaft. Part of a wing is missing. Before the introduction of chain armor to general armament, the purpose of such arrowheads was military in nature and should have produced wide cuts in the unarmored opposition. Later, they were used for hunting and battles against lightarmored enemy units like archers. Arrowheads of this form-family were, almost without exception, shot with the bow. Their largest cutting width is in either the center or the upper third of the blade. The shaft tang is characterized by a collar. Arrowheads with two barbed hooks are not rare in Europe. However, tangs are rare in this form-family. If one looks at the Germanic, Celtic and Slavic cultural groups, a preference for socketed arrowheads with barbed hooks can be seen. Tangs occur rarely, the cause of which is still unclear. Nevertheless, they occur in all European regions, albeit at different frequencies. Twisted blade bases occur as frequently as profiled ledges. Due to the broad time span of their use, an exact dating of arrowheads of this form-family is usually uncertain. Three-sided arrowheads are also more frequently found in Slavic men’s graves from the 7th and 8th centuries, because they were implemented for military purposes. Before the general introduction and distribution of chain armor, three-sided arrowheads successfully eliminated unarmored or leather, linen and wood-reinforced opponents. From the 10th century onward, their importance in military technology declined, and three-sided arrowheads formed a niche until the 14th century. In some regions of Europe, they disappeared completely after the 10th century. Arrowhead with triangular construction and three wings. 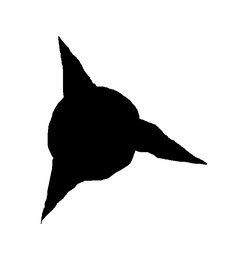 The triangular shape is clearly visible on average. Arrowhead with almost completely triangular construction. The wings are only short pronounced. Arrowhead with small triangular structure and long wings. Arrowhead with round socket and three wings. Tetragonal Bodkin arrowheads reach different sizes, but lengths of 12 cm or greater are exceptional for bow use. The exemplar shown above has a square cross-section and a socket opening near the blade tip. Such form-types have mostly a military origin, but were also used for hunting animals. The country of origin is Hungary. 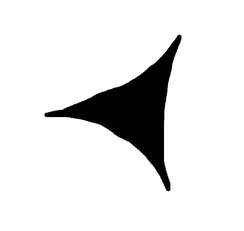 A subcategory is a conical arrowhead without a transition from the socket to the blade. They are completely round, and the socket shaft extends far into the blade. A further subcategory includes Bodkin arrowheads with twisted shafts and partly distinct blade tips. Square or round forms occur regularly in Europe. Armor-breaking arrowheads have thin, needle-like forms, which break chain armor and, in a more pronounced form, plate armor, as well. In this form-family, a distinction is made in the width of the cutting edge. Narrow arrowheads should, above all, penetrate the body deeply and remain stuck within. However, differences can also be identified by means of shaft tangs. 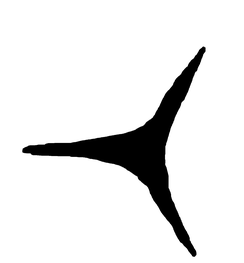 The figure above shows an arrowhead in a droplet shape. The rounded cutting edge was dull, but no less dangerous than other forms for hunting.